Yes this is true, as technology is advancing for your benefit so is for your harm. There are no. of phishing attacks daily to steal your confidential bank details… read ahead to see phishing in action. Phishing is the act of attempting to acquire information such as usernames, passwords, and credit card details (and sometimes, indirectly, money) by masquerading as a trustworthy entity in an electronic communication. Communications purporting to be from popular social web sites, auction sites, banks, online payment processors or IT administrators are commonly used to lure unsuspecting public. In simple words, when someone tries to steal your confidential information. I got an email from SBI stating that they need to reconfirm my details as required by RBI. That’s perfect ! 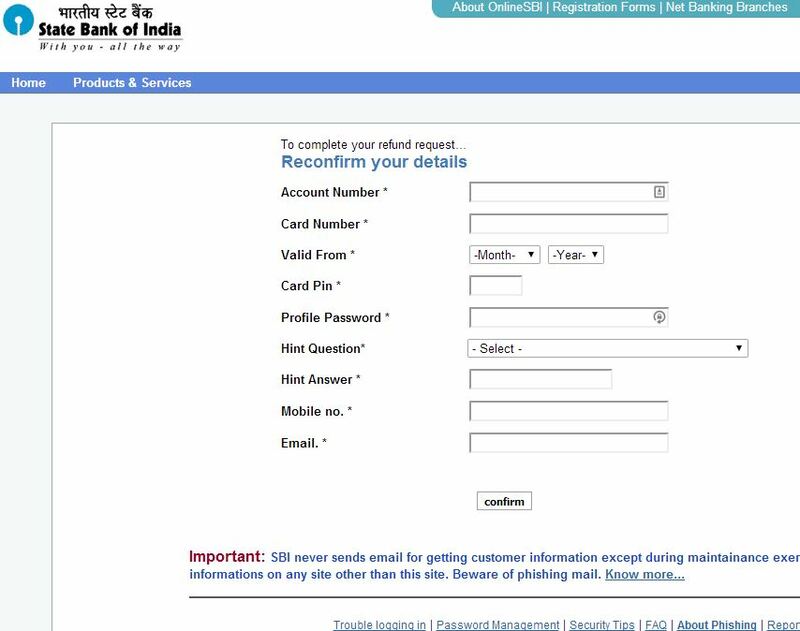 As I have previously used SBI online I know this is the SBI website… But wait, let’s look at the address bar. It says steponline.com, well there is something wrong with this. Ok. let’s go ahead and try to login as there is no harm in logging in . Now on this page it is asking for all information that is required to operate your account. So if you fill and submit this page your complete information will be saved with the sender and then they can easily login and operate your account. So now you have an idea how harmful is online banking…….. if you are not playing it safe. Also see the green bar with lock sign and State Bank of India written in it. This is extended security which SBIonline website has taken and it this bar is there, it tell you this website is real. So the takeaway here is, online banking is good… but all you need is to be careful while using any of your bank information on the internet or phone or anywhere else. I am giving the phishing website link below, so that you can see for yourself. Do not punch in your real account information in it.